yeah, that’s how i felt with this coat. for some reason it felt like it was dragging on forever, even though i only spent a week and a half from cutting to finishing. impatient much? lately i feel like i’m in some sort of weird time warp and i can’t accomplish anything. of course that may be because the sun goes down at 3:30 in the afternoon (okay, 4:30. but still) and the dark makes me move at half speed. LOOK! I MADE ANOTHER COAT!!! i was hoping that everyone’s coats would make it through this winter but alas, it was not to be. a quick peek at prices online and it seemed like anything in the $30-ish range was a puffer coat. which the kids have been wearing the past several years, so i was hoping for something a little less… uh, puffer. 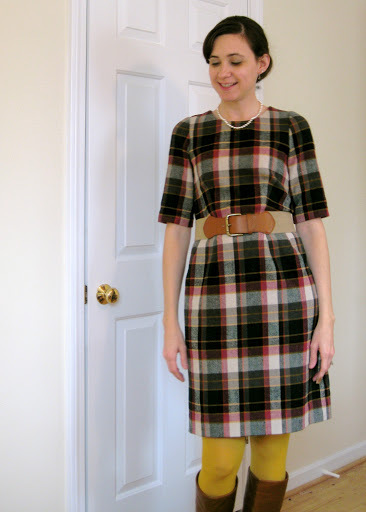 then this pattern popped up on burda and a quick math check told me i could make her a nice coat for about the same price. i like this pattern because it’s casual but still polished looking. plus it’s not really tailored so i didn’t have to worry too much about a perfect fit or, you know, tailoring. i picked up this coating fabric for $10/yd at joanns (50% off the regular price of $19.99/yd), so i felt like it was a good deal. it looks like wool, but it’s a poly/rayon/spandex blend. not sure what the spandex is in there for, it isn’t stretchy at all. 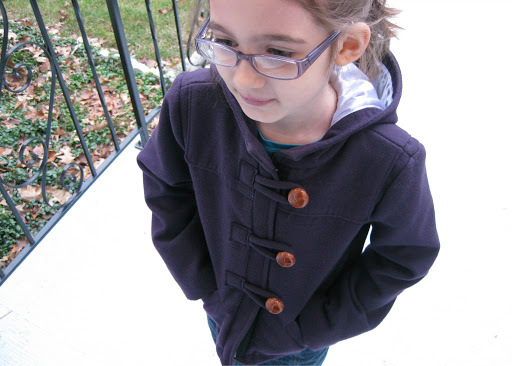 as much as i prefer wool, i wasn’t sure that an everyday coat for an 8 year old needed to be the real deal. hopefully this will be quality enough that it won’t pill too badly. then i picked up some flannel backed satin as lining, which also happened to be on sale. go me! blurry pic—only one i got of the back. oops. 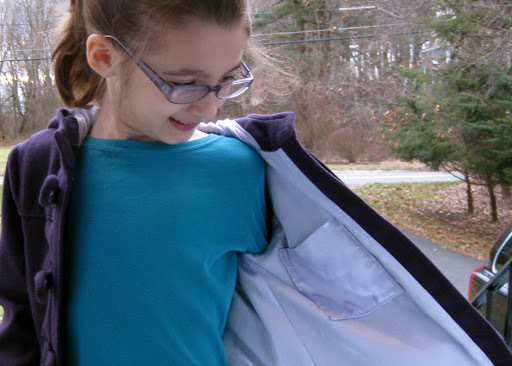 the exterior pockets were single welt pockets, that i switched to inset welt pockets. on a regular single welt pocket, the welt is slip stitched to the outside and i felt like that wouldn’t hold up very well for such a heavily-used pocket. the inset welt is made essentially like a double welt pocket, only with one fat welt instead of two skinny ones. overall, it feels more sturdy. the other change i made was to the hood lining. the entire inside hood was supposed to be cut from lining material, but i changed the pattern pieces to made a faced edge. i just thought i would look nicer that way. you can kinda see what i’m talking about in the first picture. and i changed the button styling. initially i planned to do the toggle buttons, per the pattern, but i couldn’t find the number i needed in the size i wanted or with the cording the right color or thickness… it was getting complicated and i didn’t want to bother with ordering anything. so i picked up some large buttons and thought maybe i could just work out a loop closure instead. i made loops from bias strips of the coating fabric (the same as how you would make spaghetti straps) and basted them to the front, then cut squares of fabric (cut on the bias to prevent fraying then backed with fusible) and topstitched them to cover the ends of the loops. i am sooooo happy i couldn’t find the toggle buttons i wanted because i really love how this came out. i think the leather buttons stand out nicely and dress it up a bit. overall this is a really nice coat pattern; i love the styling and all the great details. but, a pattern review wouldn’t be complete without a list of complaints, so here goes. my biggest peeve is the zipper insertion. 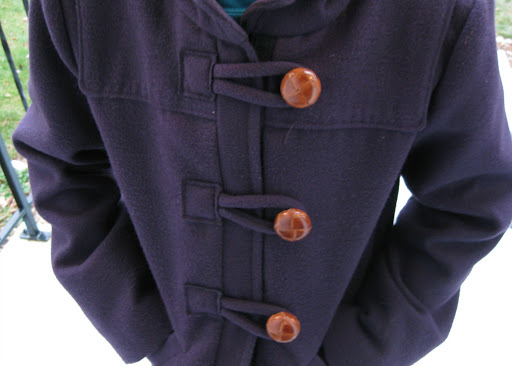 the zip tape is simply top stitched to the front band of the coat instead of being recessed into the seam of the band. i hadn’t noticed this on the pattern illustration because their zip matches the shell fabric so well. if i had to do it all over, i would add a little width to the left front piece to properly secure the zip inside the seam. the other thing that puzzled me was the lining cuff, or windcatcher. i muddled through the directions and figured out how to construct it all, but once the shell and lining were attached at the sleeve hem, the cuff was recessed slightly from the hem. the pictures make it look like it should be sticking out or at least even with the sleeve hem. it’s not a big deal, but the pattern doesn’t really specify whether to add a SA to the rectangular pieces it says to draft (i did add it) and instead of marking the line on the sleeve where to attach the cuff it just has a point to measure to. which is fine, but i think the measurement was supposed to be taken from the bottom of the sleeve lining piece, not the hemline, which is how i read it. had i stopped to do a little math before stitching it all together i probably would have caught this. at any rate, these are just a couple things to keep in mind. 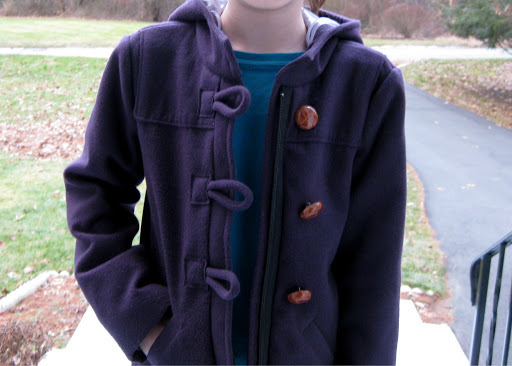 this pattern has a boy’s version (longer with patch pockets) which i’d like to sew up for my son next winter so i may have a chance to right these wrongs! added a patch pocket to the inside. all told, this coat is a winner. anastasia loves it and had to convince her friends at school that her mom made it. awww… they think i’m cool! and as soon as i figure out how, i’m going to enter this project in the december pattern review contest, sewing for children. wish me luck! UPDATE: coat is entered (i think), voting begins jan 2 for PR members. wooo! 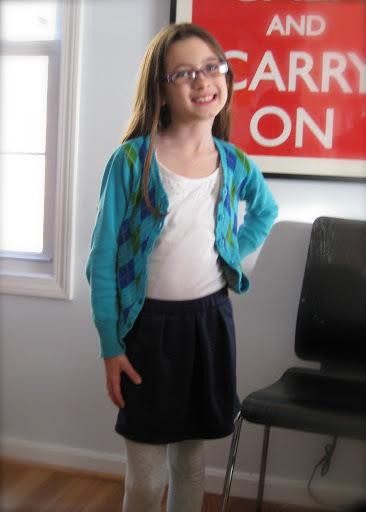 i made up a quick skirt for my daughter, anastasia, using a pattern from burdastyle.com. love or hate the .pdf pattern downloads, the taping and tracing, etc, they have been absolutely hitting it out of the park with their kids patterns. i defy you to look at the kids section and not find something you wish came in adult sizes. the directions are, at best, questionable… but since there is a general lack of good kids patterns i don’t mind puzzling it out for myself. from start to finish, this skirt took less than two hours. i used a navy ponte knit from joanns and it only used up about half a yard, plus some lining for the pockets. i stayed true to the design but changed the waistband slightly and eliminated the side zip. 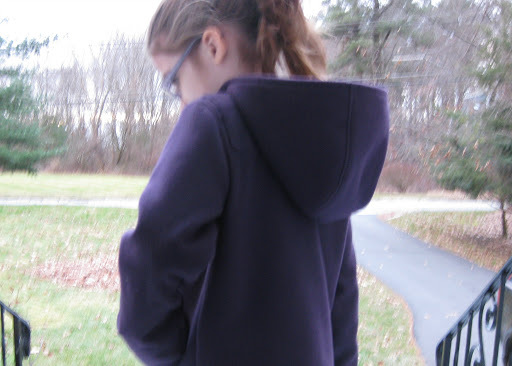 my daughter is quite thin and the finished waist measurement for a US sz 7 (she’s 8) was equal to her hip measurement. since i used a knit, i figured the zip was unnecessary. 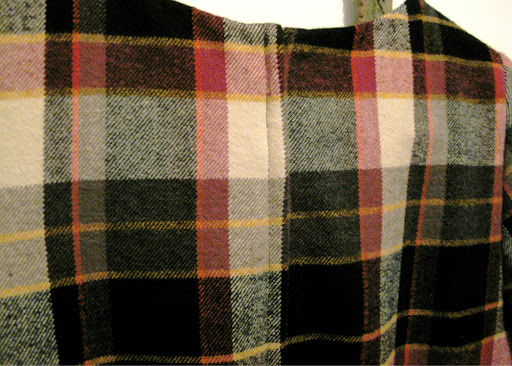 i cut the waistband as one piece and so the finished width would be 1 1/2″. 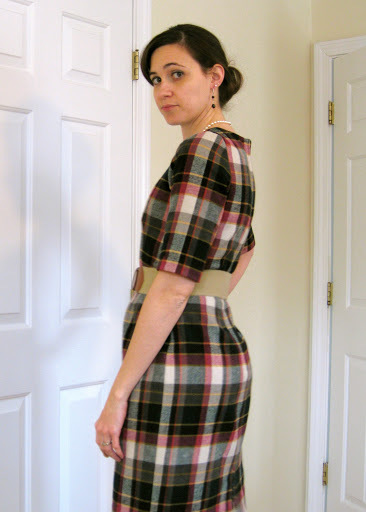 the pattern has a 1″ shaped waistband cut in 4 pieces (front, back, inside front, inside back). all the seaming caused a lot of unnecessary bulk so i ripped it out and cut the simplified one piece waistband, then later inserted elastic. navy is really hard to photograph! ponte knit can get a little bulky since it is thick and doesn’t really press flat. to keep the waistband nice and neat i sewed the waistband piece into a circle (leaving a little opening to insert elastic later), attached it to the front of the skirt then folded it to the inside then stitched in the ditch to catch the inside of the waistband. ordinarily i would have folded up the inside seam allowance, but this time i just left it flat to keep the bulk down. incidentally, if you ever have trouble “stitching in the ditch” i sometimes pull out my invisible hem presser foot and adjust the guide to line up directly with my needle. 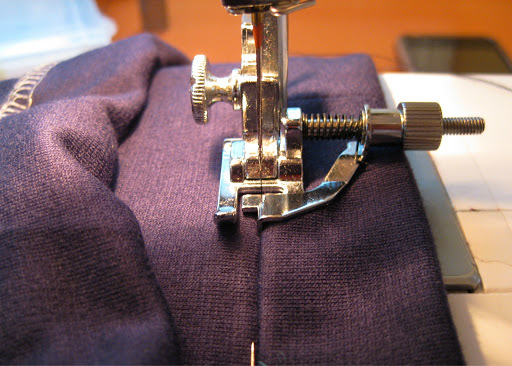 the little guide piece sits inside the seam and keeps it all in line as you sew. after, i added some elastic then slip stitched the opening closed. as writ, this skirt is really, really, really short. half the reason i bother making skirts and dresses for my girls is because i hate the itty bitty minis found in RTW for kids her age. she’s thin, so she has to size down her skirts making them even shorter… this pattern has a longer version, but i felt that one was too long. 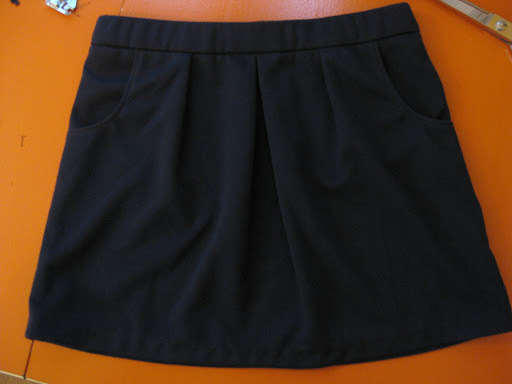 i compromised by adding 2″ in length to the shorter skirt. ah… just right! it’s still shorter than pretty much any other skirt she owns, but i intended it to be worn with thick tights or leggings. i finished off the skirt with a machined blind hem. she loves this skirt a lot and i fully intend to make at least one more, maybe in a brighter color. i do wish the fabric had more body, i feel it hangs a little limp. the pattern suggests a sweatshirt-type knit, but i think a woven would be really nice too. twill, denim, or even corduroy. on another topic, i was bumming around pattern review and decided to check out what the december contest was going to be. turns out, it’s kidswear. 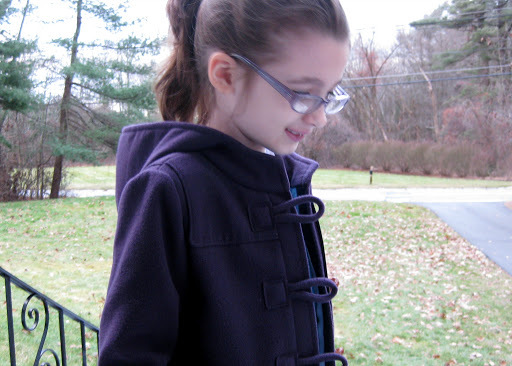 i’m in the middle of making anastasia a winter coat (burdastyle.com duffle coat) so i signed up! i’m super loving how the coat is turning out and hope finish it up soon! i definitely struggled with this dress more than i thought i would, but it all worked out in the end. i chose mccalls 5927 because of the simple lines in the bodice and plain but not too plain skirt. let’s face it—i’m a sucker for pleats and pockets. 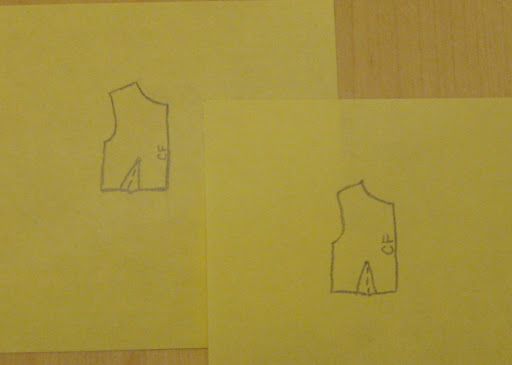 i mentioned before that i’m trying to work out a fitted bodice pattern or sloper that i can have on hand. after a few adjustments i think i’ve come pretty close with this one. the pattern came with several different bodice pieces based on bust size. i thought this would be super helpful in getting to my target shape a little faster. unfortunately, they treat both A and B cup sizes as one. not so helpful. past experience has shown me that i need a 1 1/2″ dart intake. this bodice has a 2 1/2″ intake so i was able to immediately spot and adjust this. i had just read through the palmer/pletch “fit for real people” and one very good point of advice they give is to pick your bodice size based on your upper bust measurement, then adjust as necessary to fit your waist. in retrospect, i should have been able to figure this out myself. i quite often stared and stared at those bodice cutting lines because my bust lands me a much smaller size than my waist. then, even though i’m 5’8″, i usually need to do a petite adjustment (taken out above the bust) then add the removed length back in under the bust. then for your lower half you should pick a size based on your hip measurement and adjust the waist to fit. totally obvious, but still a lightbulb moment for me. 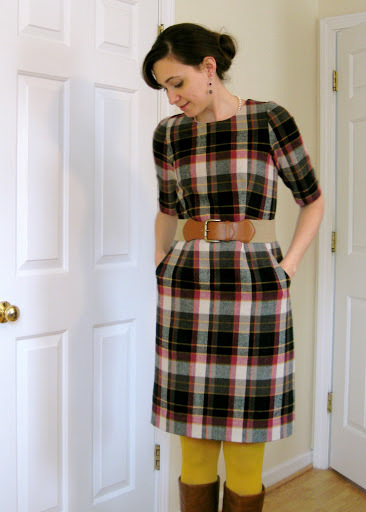 i love my plaid fabric, and a darted bodice is really nice for not disrupting the pattern as much as a princess seamed bodice would. however, if you’re working with a stripe or plaid, the waist dart can make the lines go all jagged in a soul-crushing sort of way. OCD much? guilty. but not to despair… there is a super easy way to fix this. draw a line through the middle of your dart. then, pivot the dart as necessary to make the center line run parallel to CF. 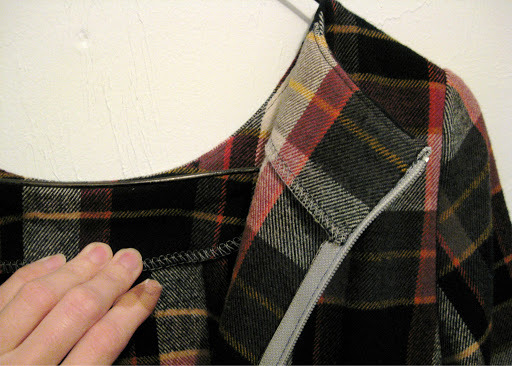 now when you stitch your dart, the plaid/checks/stripes will match up and chevron at the dart seam. genius, i know. 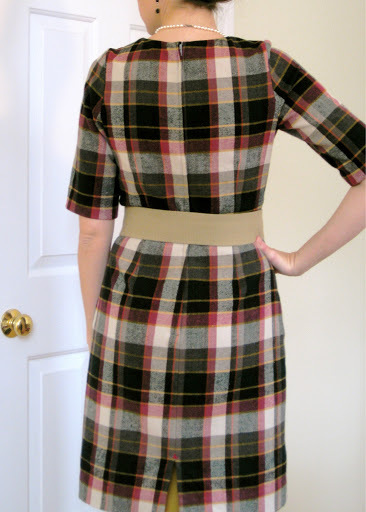 now, if your skirt has a match point that is supposed to line up with the dart (pleats or front darts), keep in mind you’ll have to adjust that as well. because i was using this squishy, comfy, cozy flannel, i chose to leave the bodice unlined. which is ironic because i usually end up adding linings to dresses and then griping about the fact that the pattern doesn’t include lining instructions. if you’ve never lined a dress before and/or fear the very idea of lining a dress, rest assuraed. this pattern has directions for a FULL lining. even the sleeves. which seems kinda weird, but there you have it. this flannel has a sort of natural stretch and it’s quite thick. all in all, it feels really nice against my skin and has enough movement to be super comfortable. the only reason why i lined the skirt was so i could wear tights. this is obviously a winter dress and tights are a must. i used a bemberg rayon and it’s perfectly slidable. no crazy ride ups! since i didn’t line the bodice i drafted a facing. i know some people avoid facings like the plague but i happen think they’re great for a clean neckline finish. 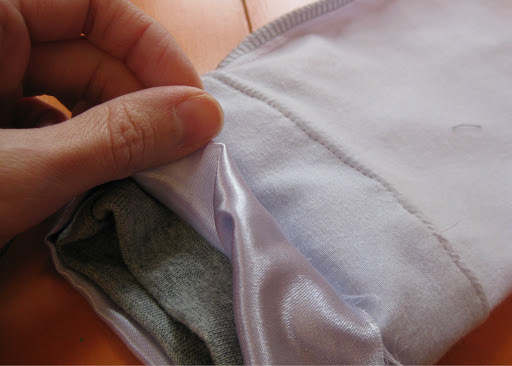 since this fabric has a tendency to stretch funny and get all bent out of shape (it has a twill weave) it also helps to stabilize the neckline and keep it in check. the only place that really gave me nightmares was the zipper install. 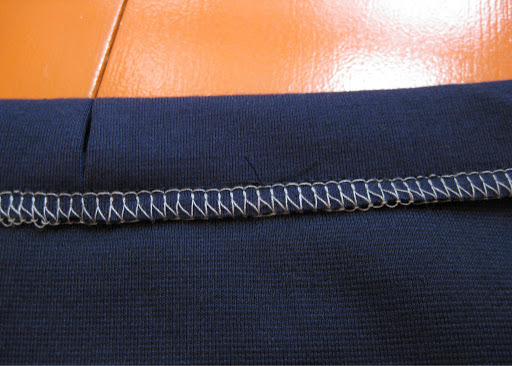 an invisible zip was not an option given the thickness of the fabric so i got a standard zip and had intended to do a standard zip install. 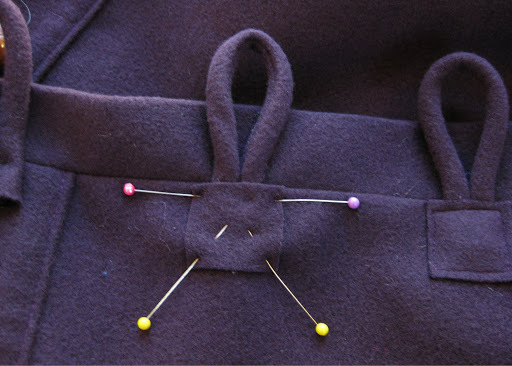 so you’re supposed to baste the opening closed, topstitch around the zipper, then remove the basting. so i basted, pinned the zip in then went to topstitch. but… see that high, narrow neckline? nope. can’t get it through a sewing machine when everything is closed up. i tried to go in from the skirt side, but that was so awful and wonky i quit after a couple inches. as usual, i made this far more complicated than necessary, and ended up going for a lapped zip. i had only done a lapped zip once before and it seemed really hard and didn’t work out. i think i did the zip three times only to eventually rip it out and hand pick it months later. so i never tried it again. but for this dress, a lapped zip was the only remaining option. i ripped out all the stitching i had attempted, un-basted the seam, added some fusible to stabilize the edges, and lapped that zip. and it went in perfect with my first try. go figure. i don’t often do a narrow skirt but thought it would be a nice departure from my more pouffy gathered dresses. the skirt is slightly off in fit, i could use another inch of ease in the backside. but who’s counting? i already let out the side and back seams as much as i possibly could. rookie mistake… i didn’t check the pattern’s finished hip measurement. oops. i think i’ve determined though, that my hips aren’t that wide, just le booty. things you don’t learn from making gathered skirts, huh. and/or add a back neck dart to fix the gaping. so there’s my long-winded final analysis of this dress. 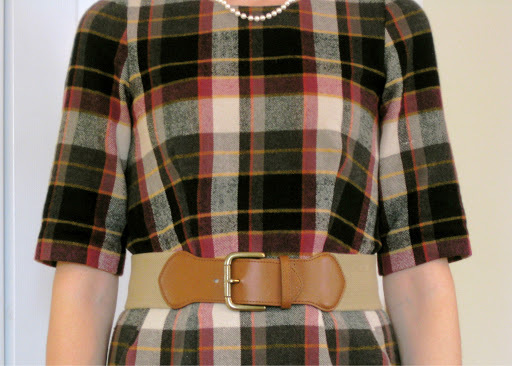 my only real gripe is that for this large scale plaid i should have gone with a pattern without a waist seam; unless i’m wearing a belt it just looks funny. that and i could totally stand narrowing the sleeves a touch, they’re slightly boxy but… next time, right?